Interest rates continue to decline across the globe, while returns to capital remain constant or increasing. The reasons for this widening risky-safe gap are wide-ranging. This column illustrates the secular rise of risk intolerance in the global economy, and summarises a new macroeconomic framework suitable for this environment. It uses this framework to discuss the current global macroeconomic context, its underlying fragility, and the coexistence of low equilibrium interest rates and high speculation. One of the starkest facts of the global economy in recent decades is the steady decline in safe interest rates around the world. From 1990 to today, US Treasury rates (of all maturities) have declined by nearly 800 basis points (see, for example, the update of Laubach and Williams 2003 for a comparable path for the natural interest rate, which highlights that this is a structural phenomenon). As pointed out by Caballero et al. (2017), this secular decline contrasts sharply with the return to physical capital in the US economy, which has remained constant or slightly rising over the same period. 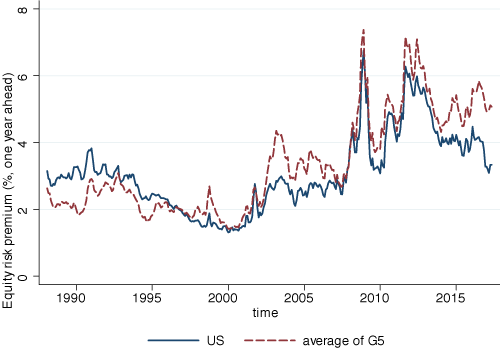 While there are a variety of contributing factors behind this widening risky-safe return gap, ranging from reduced competition in goods markets to technological changes, the dominant one is a steady rise in the equity risk premium since 2000, which was exacerbated by the Subprime Crisis and has only recently began to recede in the US, but has continued its rise in the rest of the G5 economies (see Figure 1). This rise in the degree of risk intolerance is a global phenomenon with significant macroeconomic implications for the global and individual economies, some of which we discuss below. Notes: Solid line plots the (forward looking) equity risk premium for the US. Dashed line plots the unweighted average equity risk premium for the G5 countries. Source: Constructed by Datastream as the median of nine different methods to calculate the ERP. Conventional macroeconomic analysis puts its emphasis on the (potential) output generated by the productive capacity, and on the optimism of consumers and firms that creates the demand for this output. If the latter is insufficient, a recessionary output gap arises, which may be partially offset by monetary and fiscal policies. Instead, in a recent paper we argue that in the current risk-intolerant environment, it is important to expand the analysis to one that highlights two potential gaps (Caballero and Simsek 2017a). The existing (and expanding) productive capacity not only generates output but also risks, both of which need corresponding demands. If the demand for risk is insufficient, output and risk gaps emerge. These gaps feed into each other and have the potential to cause deep contractions. To see these interactions and the role of monetary policy in this expanded environment, imagine a situation where macroeconomic uncertainty rises. The first reaction to such a shock is a reduction in economic agents' desire to hold the risk produced by the productive capacity, embodied in the financial assets generated to fund that capacity. In this context, monetary policy works by reducing the opportunity cost of risky investments. By cutting safe interest rates, the central bank raises the equity risk premium and hence it compensates economic agents for the increased uncertainty they perceive from holding risky assets. That is, monetary policy closes the risk gap, and by doing so it prevents the opening of an output gap. But what if interest rates cannot be adjusted enough to fully offset the rise in increased volatility? In developed economies, this is likely to happen due to the proximity to the zero lower bound (or to the effective lower bound below which there could be a negative impact on the financial system), while in emerging market economies the constraint is more likely to arise from concerns with sharp depreciations or inflationary spikes. Then a risk gap develops and drops (risky) asset prices, which reduces consumption through a wealth effect and investment through a standard valuation (marginal-Q) channel. This causes an output gap, which lowers profits and asset prices, and further increases the risk gap. This potentially deadly embrace between risk and output gaps can only be stopped by enough optimism about a recovery, for in that case the drop in asset prices generates an expected capital gain which eventually incentivises agents to demand risky assets (thereby closing the risk gap). That is, what started as a risk gap ended up in an output gap caused by the drop in aggregate demand following the required (to close the risk gap) drop in asset prices. Even more worrisome, if economic agents are pessimistic and expect the elevated uncertainty episode to be a lasting one, then the drag of the asset price drop on aggregate demand and profits is strong relative to the expected capital gain caused by the drop – which triggers a deep downward spiral and recession, with asset prices and aggregate demand pulling each other down. The trigger of the above recessionary process is an exogenous risk shock, but volatility also rises endogenously. Without interest rate rigidities, the interest rate policy optimally mitigates the impact of risk shocks (such as volatility spikes) on asset prices. When the interest rate is constrained, these shocks translate into asset price volatility, which further depresses asset demand and equilibrium (natural) interest rates. This prediction lends support to the many unconventional tools aimed at reducing downward volatility, which the major central banks put in place once interest rate policy was no longer available during the Great Recession (see Caballero and Simsek 2017b for an analysis of central banks’ policies in this environment). While the downward spiral captures well the years that followed the subprime and European crises, the world is currently enjoying strong momentum and low volatility. However, the implications of this risk intolerant environment and perspective also permeates normal (non-recessionary) low-volatility times in somewhat unexpected ways, which is the theme we explore in Caballero and Simsek (2017b). The concern with the downward spirals illustrated above feeds into risk intolerance during the recovery phase, which depresses safe interest rates. These depressed rates fuel speculation by relatively optimistic agents. When there is more speculation, the economy is even more exposed to a spike in volatility, as this could now wipe out optimists and lead to a deeper crisis due to lack of optimism (as described above). Thus, speculation adds to the uncertainty perceived by the median agent and further lowers the natural rate. That is, fear lowers the natural rate, which not only keeps rates inconveniently close to the effective lower bound but also drives speculation, which further fuels fears, and so on. To compound matters, this endogenous fragility has been exacerbated in the current context by the fact that the mapping from asset price valuations to aggregate demand has shifted down. On the consumption side, worsening wealth inequality has lowered the marginal propensity to consume out of wealth. On the investment side, increased markups have shifted down the relation between real investment and asset prices. This means that higher valuations are required today to generate the same level of aggregate demand of a decade or two ago. The equilibrium mechanism that validates this higher valuation is, again, a depressed natural interest rate, which adds and feeds into the risk-intolerance mechanism. In this environment, there is clear scope for macroprudential policy, because optimists' risk taking (and the resulting speculation) is associated with aggregate demand externalities. The reduction of optimists' wealth following a volatility spike reduces asset prices and aggregate demand. Optimists do not internalise the effect of their portfolio risks on asset valuations (in case there is a volatility spike), which leads to socially excessive risk taking. We show in Caballero and Simsek (2017a) that macroprudential policy that restricts optimists' risk taking can lead to a Pareto improvement (that is, we evaluate investors' welfare according to their own beliefs). Moreover, the policy is naturally procyclical as the tightening of prudential regulation always has a negative impact on current aggregate demand – but this effect can be easily offset with interest rate policy when volatility is low, but not when there is a severe volatility spike and the effective lower bound is binding. Not only does the current full employment equilibrium seem to require high valuations, low interest rates, and a high equity risk premium, but it is also taking place with record low levels of realised market volatility. Risk market equilibrium seems to require a very high Sharpe ratio to generate the valuations required to support aggregate demand. This makes the global economy extremely vulnerable to a persistent spike in volatility. What could cause such a spike? Historical evidence suggests three main dangers, either a technical market correction, a recession (for reasons other than a spike in volatility), or a geopolitical event. While the former is a concern for short-term returns in financial markets, it does not seem to be the most pressing concern for the global economy as it is unlikely to trigger a lasting spike in volatility in the absence of a domino effect on the financial system (which seems distant at this time given the high level of buffers in the major financial centres). By the same token, the current momentum of the global economy does not foresee an impending recession (for reasons other than a lasting volatility spike). Having said this, if we were to see a volatility spike that pushes the economy into a recession, the latter in itself would raise volatility endogenously. We are left, then, with a significant geopolitical event as the most likely source of a destabilising volatility spike. This is problematic not only because most broadly known indicators of geopolitical risks are currently elevated, but because unlike all previous low-volatility episodes since the 1920s in the US, this time around the level of safe rates is extremely low. Without the buffer of an aggressive monetary policy, the economy finds itself uncomfortably close to the downward spiral risk scenario described above. In summary, the world economy is currently ‘bipolar’, in the sense that there is a very short distance (in volatility space) between the current (good momentum, low volatility, high speculation) environment, and a global recession induced by a risk perception spike. Caballero, R J, and A Simsek (2017a), "A Risk-centric Model of Demand Recessions and Macroprudential Policy", MIT mimeo. Caballero, R J, and A Simsek (2017b), "Destabilizing Speculation and Central Bank's Policy Puts in a Low Interest Rate Environment", MIT mimeo., forthcoming. Caballero, R J, E Farhi, and P O Gourinchas (2017), "Rents, Technical Change, and Risk-Premia: Accounting for Secular Trends in Interest Rates, Returns on Capital, Earning Yields, and Factor Shares", AER Papers and Proceedings, May. Laubach, T, and J C Williams (2003), "Measuring the Natural Rate of Interest", Review of Economics and Statistics 85.